It’s a full house at the opening night of The Two Gentlemen of Verona. It’s a wonderful performance. We are spending a perfect summer evening in a tent at the beach for one of Shakespeare’s great comedies. 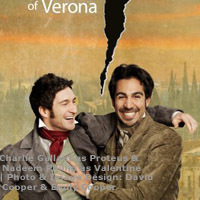 The Two Gentlemen of Verona is about two best friends, Valentine (Nadeem Philip) and Proteus(Charlie Gallant) who are both in love with Sylvia (Adele Noronha), another man’s girlfriend. The other man is Turio (Kamyar Pazandeh), a wealthy nobleman. Sylvia’s father, (the Duke, Edward Foy) wants her to marry Turio. This love Proteus has for Sylvia will cause a double problem for him since he already has a girlfriend, Julia (Kate Besworth). Although Proteus leaves Julia behind, Julia decides to follow Proteus to the Duke’s residence without Proteus’s knowledge...and so the plot thickens. The costume designs (Mara Gottler) are perfect for this period stage performance. The costumes are colourful and elegant. It’s great to see some effort in costume design. The play is well directed. The actors’ performance is flawless and the physical agility of the actors is impressive. I loved the fun choreography (Tara Cheyenne Friedenberg). At the beginning of the play we had trouble hearing the dialogue. It greatly improved however as the play rolled along. Proteus’s servant Launce (Andrew Cownden) shows up on occasion with his dog, Crab, a basset hound with big brown eyes that captivates the audience. Valentine’s servant, Chirag Naik’s (Speed) acting stands out because he is so animated and he adds a really funny and uplifting character to the story. I am also impressed with the three rogues in the forest. I just loved that particular part of the performance. The three are hilarious. The fencing between the nobleman Turio and the Duke is also quite well done. It isn’t often that one can see swords in action in a live performance. The acting was fabulous. The lines flowed. The tremendous work and time that went into their rehearsals is evident. Those hours of dedication made this opening night’s performance a success.